My side of our weekend to-do list could also be titled: things I avoid. I challenged myself in an afternoon to take care of a bunch of things I dislike doing (the floors) or don't need to do regularly (cleaning blinds/filters) that were in serious need of being done. They're not even that difficult, but for some reason I always procrastinate on them. And good news is, it didn't kill me to do them (ha!). Aside from a tiny cut on my finger I came out alive. By the way, I'm so glad we only have blinds in a few rooms - they were embarrassing to clean and probably should be done regularly. I hate doing blinds as well. Ugh. I recently made my husband a to do list and he then made me one...everything I put on his he put on mind. He figured I would do it more efficiently so he wouldn't have to - sneaky right? I'm the same way... there are a few things I avoid like the plague, but when I get them done, I always feel so much better! glad to see Q was able to accomplish "being cool" this weekend :-) i always put off mopping the floors - hate it! gloria - worst cleaning job ever, there's so much of it to do! heheh the be cool cracked me up!! I love how yours is longer than his : ) Good job!! I should probably clean the blinds at some point...haha. What cannot kill will make you stronger, huh, who said cleaning blinds is easy, better think too. Like the "be cool" to do is that even a task, haha well good thing you've over come your dislikes. Cheers for that. 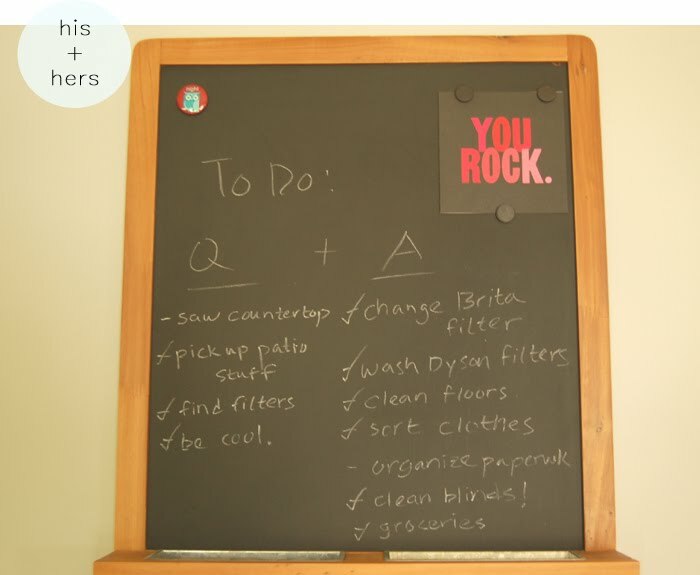 love those to do lists....good idea to put it on a chalk board. i've got a chalkboard to-do list. my husband added "make out" to mine... haha. Where do you hang the chalk board / where did yo get it? I'd like to make one perhaps using chalkboard paint even.